Recently, scientists using NASA’s Cassini spacecraft noticed a strange ding in one of Saturn’s rings. Saturn is sometimes called the “Jewel of the Solar System.” With shimmering pinks, hues of grey and a hint of brown, its rings resemble a fresco where nature is the painter, NASA writes. The rings, which are only about 30-300 feet thick, wrap around the planet for about 175,000 miles. The dent was found in Saturn’s F ring — its outermost discrete ring. 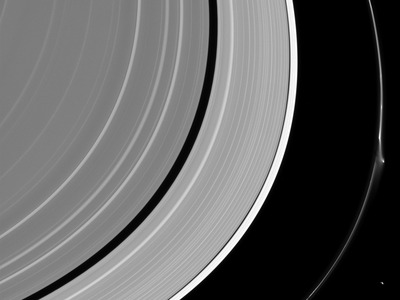 The F ring just might be the most active ring in the solar system. Scientists can see its features changing over the course of a few hours. The disruption, NASA said, was probably caused by a small object embedded in the ring. When the small object interacted with some of the stuff in the ring’s core, it produced something that scientists sometimes refer to as a “jet.” Astronomers think that these jets form thanks to the gravitational pull of Saturn’s small, potato-shaped moon Prometheus. The collision itself actually happened pretty recently — within a day or so of when this image was taken on April 8, Weiss said. In the two months since the picture was taken, “the wound has just about stitched itself back up,” National Geographic writes.